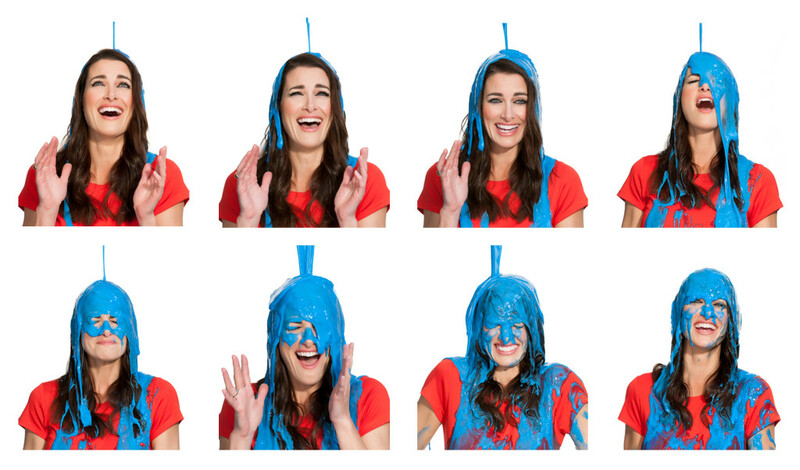 How to make gunge for Comic Relief with Persil! Even telly presenter Kirsty Gallacher’s been having a go! It’s Red Nose Day and if you want to have a go at something super silly, why not try making your own gunge? Our pal TV’s Kirsty Gallacher has passed on a great recipe that she’s been using! It’s well easy to do and only needs a few ingredients that you can find around the house! Click here to check out Kirsty’s top gunging tips! Just make sure you check with a grown-up first as it can get… well, pretty messy! In fact, it’s probably best to have a bottle of limited edition Red Nose Day Persil on hand to help clean all the messy clothes afterwards! Click here to find out more about Comic Relief! 3 to 4 drops of blue paint powder. Pour 350ml of warm tap water to a small saucepan or bowl, and then wait until it is cool enough for you to put your hands in. Your hands are great for mixing the gunge – and we appreciate that you’ll want to get gunging straightaway! Pour 250ml of the warm water into a bowl (leaving 100ml to one side).Add three to four drops of the blue powder paint until the water is about a shade darker than you want the gunge to be. Mix the water and paint well with a spoon, until fully mixed. Measure 140g of corn flour and place it into a separate large-sized bowl. Pour the coloured water slowly into the bowl with the corn flour. And now for the fun bit… Get stuck in using your fingers to mix the ingredients together until you have a thick paste, but feel free to use a wooden spoon if you want. Leave the gunge too cool for 20 minutes and voila – you’re ready to gunge anyone who stands in your way! Don’t forget to take a photo of the person you are gunging and all the funny faces they make! Top tip: Double the ingredients for double the gunging fun!